Good morning, and welcome to another week! Art Garfunkel has a back-catalog as long as my arm (longer actually), so it is impossible to choose only a couple of songs that would be representative of his career, so I chose these because they were pretty and soothing for a Monday morning. In history today in 1605 the Gunpowder Plot failed when Guy Fawkes was seized before he could blow up the English Parliament. in 1940, President Franklin D. Roosevelt won an unprecedented third term in office, beating Republican challenger Wendell L. Willkie. 1968, Republican Richard M. Nixon won the presidency, defeating Vice President Hubert H. Humphrey and third-party candidate George C. Wallace. 1872 Suffragist Susan B. Anthony was fined $100 for attempting to vote in a presidential election. 1999 A federal judge declared Microsoft Corp. a monopoly. 2006 Saddam Hussein was convicted and sentenced by the Iraqi High Tribunal to hang for crimes against humanity. In Poland today it appears that Hili is taking an admirable approach to Monday. 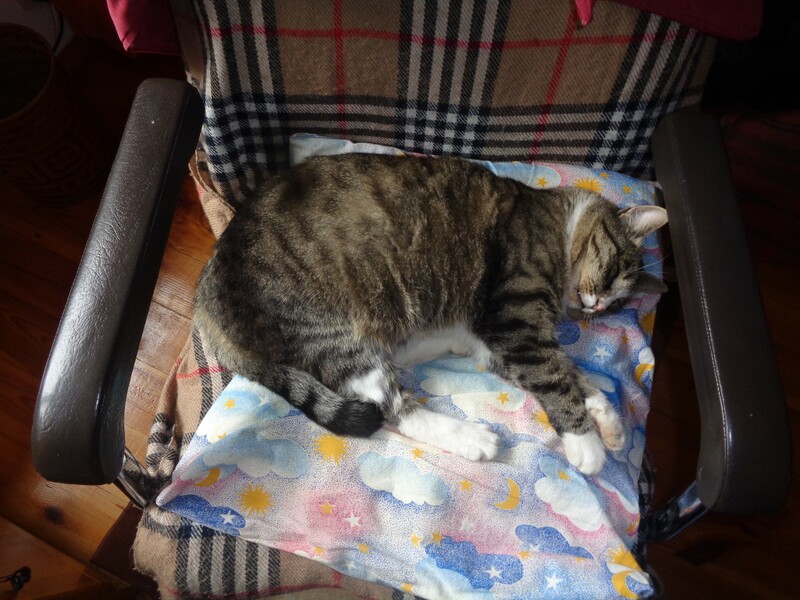 Hili: OK. Wake me up when it’s over. Hili: Dobrze, obudź mnie jak się skończy. Undoubtedly the most inspiring words after the recent horror in Pittsburgh. Click through on the Tweet below to read the rest of it. If only all humans had the grace to think and act in this way, the world would be an infinitely better place. And another piece of music, because why not. Bureaucracy’s only purpose is to break our brains. On the other hand, Geek Passport, heh. This entry was written by whyevolutionistrue and posted on November 5, 2018 at 6:30 am and filed under Hili Dialogue. Bookmark the permalink. Follow any comments here with the RSS feed for this post. Both comments and trackbacks are currently closed. I think Mr. Garfunkel deserves a credit as “actor” as well, given his roles in Catch-22, Carnal Knowledge, Bad Timing, and other films. A Helenic (sic) citizen would presumably be Trojan, not Greek. (Geekish joke that the dumb peon who wrote that form would never get). As a pun that’s a homerun. Careful. Pun cascades can get out of hand and become an odyssey. And you’re greecing the skids, aren’t you? I think the Trojan horse was on lubricated wheels, not skids. Good thing Jerry doesn’t charge us for this website, or I’d be feeling Fleeced right now. Though not if they *used* a Trojan. She used the Trojan for sure, but not correctly, since she had more than one little Parisian who didn’t survive infancy. Besides, with Menelaus she also had Hermione who should thus be considered a Helenic and Hellenic citizen. After all, doesn’t the Good Book say “Whosoever shall smite thee on thy right cheek, turn to him and empty all six chambers”? Maybe they want to have the wonderful freedom of firearm ownership the U.S. enjoys. It is an enormous benefit to a healthy society; it amazes me other countries don’t adopt their own 2nd Amendment. USA, USA!!! Where I live, nobody goes to a shooting range with his own firearm. Next week: a training session on how to throw the Holy Hand Grenade of Antioch. Here, I disagree with everybody. Shooting ranges are one of the few instances where I think firearms are OK. Small shooting ranges where kids win novelty toys have been present in our resorts and country fairs since times immemorial. veterinarian and on and on and on ad nauseum. The Other, the Not Male, the (ab)Normal. Well picked, Grania. Not sure which I enjoyed more, Denver and Cash or the gymnastic unicorn. I thought after seeing Denver and Cash my day would not get any better. Then a unicorn made me rethink that. I am reminded here of the duet between James Brown and Pavarotti. It exists on YouTube. Such wonders seldom pass our way. That cat should be afraid of being turned to stone. The moth that pretends to be a jumping spider is quite amazing. One wonders why he’d want to do that. Are jumping spiders not good enough for birds in the Philippines? Adaptation just to impress biologists, perhaps. I think it would depend on the biologist environment. Impressing a lab of comparative anatomists may not be an advantageous adaptation. The words of that nurse were beautiful. I’m normally not a sentimental guy, but that really got to me. 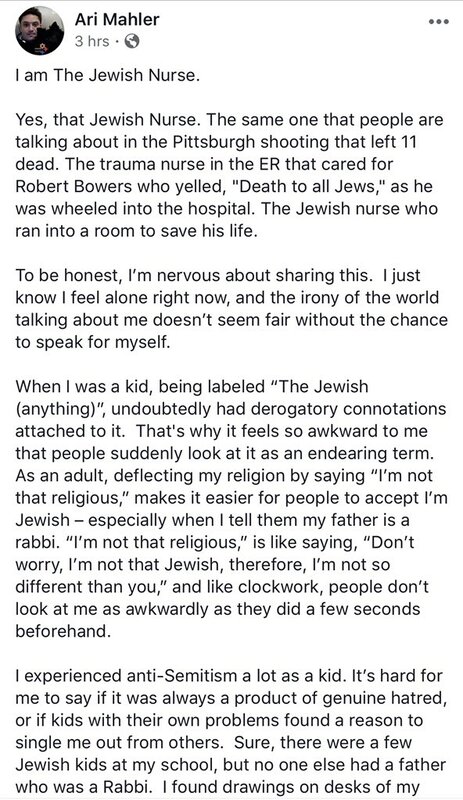 I’ve experienced plenty of antisemitism in my life, from the normal insults and having pennies thrown at me when I was in middle and high school, to college professors and students on my extremely “progressive” college campus openly talking about Jewish and Israel conspiracy theories as if they were fact. Thankfully, I haven’t experienced it since college, at least not directly. There’s anti-Semitism on the Left, especially of the Jeremy Corbyn variety, no doubt about it, stemming primarily from a misconceived sympathy for the Palestinian people. It’s despicable where it rears its head. But let us never forget that the traditional seat of anti-Semitism, especially in its most virulent and violent form, is the Far Right, as was demonstrated again by the synagogue massacre in Pittsburgh. I don’t forget any of that. But I think it’s a mistake to think that the most virulent form is on the Right. It may be the most violent (although that violence is rare, and I don’t consider crazed lone gunmen a symptom, as I would only consider that if it became a trend), but the Left is catching up in its rhetoric, allies, and media. In fact, part of what scares me about the growing Left antisemitism is that the antisemitism in Far Right media is kept to the fringes, while antisemitism in Left media is creeping quite quickly into more mainstream sources (e.g. PuffHo and various popular Left sites that aren’t exactly “fringe”). It also frightens me that Left institutions are increasingly tolerant of and often even helpful to antisemitic movements (largely talking about academic institutions here). Oh, and it also concerns me that the ideology built by the Far Left in the past couple of decades (modern social justice ideology originated with academics back in the 90’s) somehow incorporates every group it considers historically oppressed except the Jews, who have conveniently been lumped into the “oppressor” category. The only Simon and Garfunkel work in which Garfunkel actually has a writing credit is “Scarborough Fair/Canticle”. Garfunkel is the author of melody of the 2nd song “Canticle” though the lyrics are by Paul Simon, derived from a discarded Simon song “This Side of the Hill”. Of course, Scarborough Fair is a traditional Irish folk song, the original with a male voice and a female voice. The female part was discarded by S&G. 3 out of 5 of the gun collectors I have known has been anti-NRA and want more gun control. The cognitive dissonance of a bunch of clerics showing up at a gun range is astonishing. Bookends is one of the most simple, beautiful, and poignant pieces of music I’ve ever heard. Another would be Chopin’s Prelude Op28 no7 in A major. Thank you for the Garfunkel selections and the Denver/Cash duet! Just what my ears needed today! Next time somebody claims representations of double-helices in ancient art are indications of pre-1953 knowledge of the structure of DNA, they should be shown the Shaggy/Scooby-Doo drawing.